"Once again, it is up to me to get America into a bloody war in the Middle East. So me and my shotgun "Boomy" are off to Iran where I intend to shoot Ayatollah Khamenei in the face," stated the former vice president, who had former experience "accidentally" shooting a friend in the face. 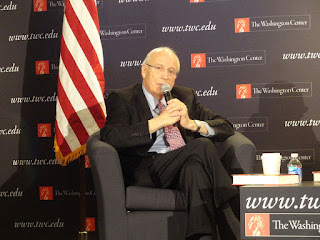 Cheney added, "I have no intention of killing the ayatollah, and just want to create an international incident to start a war between the United States and those evil Muslim Iranians. So you poor and middle class American soldiers prepare to die so rich old men can get richer." The White House quickly replied to our request for comment and stated, "Mr. Cheney's visit to Iran is not an authorized visit. We will support whatever actions the Iranians take when Cheney arrives." Iran released a statement shortly afterward stating all of Iran was "very eager" for Cheney's arrival.